A few weeks ago, I posted a map comparing English and French Wikipedias. We, perhaps unsurprisingly, found that there was more written in French about much of the Francophone world, more written in English about the Anglophone world, and then more written in English about almost everywhere else. What happens though if we compare English and Arabic Wikipedias? What we see is that there is only one country in the world (Syria) that is layered with more content in Arabic than in English. 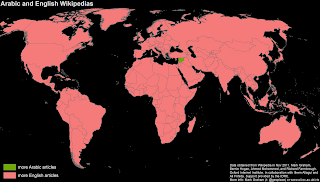 This might not be unexpected to people who know about the paucity of information in Arabic Wikipedia, but it is still worth pointing out that countries like Algeria, Egypt, Saudi Arabia, and the UAE all have more English-language than Arabic-language material written about them. What does this all tell us? First, there just aren’t that many editors to the Arabic Wikipedia and these data are likely a good reflection of that fact. Second, there also aren’t that many edits that come from the Middle East or North Africa (see also this post) - so this also helps to explain why there is more Arabic content about Spain or Russia than Saudi Arabia or Egypt. So, again, we’re seeing digital divisions of labour reproducing distinct layers, practices, and augmentations of place.